The Attachment Unit Interface (AUI) is a physical and logical interface defined in the original IEEE 802.3 standard for 10BASE5 Ethernet. The (optional) physical interface consists of a 15-pin connection that provides a path between an Ethernet node's Physical Signaling and the Medium Attachment Unit (MAU), sometimes also known as a transceiver. An AUI cable may be up to 50 metres (160 feet) long, although frequently the cable is omitted altogether and the MAU and MAC are directly attached to one another. AUI connectors became rare beginning in the early 1990s when computers and hubs began to incorporate the MAU, particularly as the 10BASE-T standard became more common and use of 10BASE5 (thicknet) and 10BASE2 (thinnet) declined. The electrical AUI connection was still present inside the equipment. With the introduction of Fast Ethernet the AUI became obsolete, and was replaced by the Media Independent Interface (MII). Gigabit Ethernet and 10 Gigabit Ethernet have respectively the GMII and XGMII interfaces. 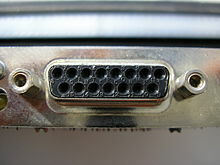 A modified form using a smaller connector called the AAUI was introduced on Apple Macintosh computers in 1991, and its use discontinued in 1998. Wikimedia Commons has media related to Attachment Unit Interface. ^ "IEEE Standard for Ethernet, Section 1, Clause 7". IEEE Computer Society. Retrieved 14 February 2017. ^ Overview of the XAUI, XLAUI and CAUI: Part1, "...the existing AUI was not suitable and it was replaced by the MII interface..."
^ Dan, Knight. "Apple's AAUI Ethernet Connector". Apple's AAUI Ethernet Connector. Retrieved 13 February 2012. This page was last edited on 21 January 2019, at 00:04 (UTC).